SafetyNet Software provides companies with practical and easy to use methods for ensuring business continuity and accelerated recoveries from outages and disasters. Rather than backing up once a day or once a week and storing data on tape, disk-based application protection programs run continuously, taking snapshots and copying only changed blocks to a server. The continuous data backup snapshots occur at 8 GB/min - that's 10 times faster than tape. Additionally, the backup images the entire application stack, not just files. As another layer of protection, backup replication of your data to an offsite data center is also available. With dual backups, you can assure your data is safe in case of a disaster. It is much easier to retrieve and restore lost data whether a single e-mail message or entire database. Rather than mounting and searching through backup tapes to locate needed data and then restoring that data to an application � a process which takes at least hours � administrators using disk-based application protection conduct restores in minutes. For a complete server restore, the admin can rewind to the last "good" point-in-time image. End-users pick up where they left off just minutes before. The only backup software that checks your databases for corruption. This means that your other choices only protect you 80% of the time in a failure event. From a justification view � other choices do not meet the minimum requirement most IT folks have set of being able to recover from all failures within 4 hours. 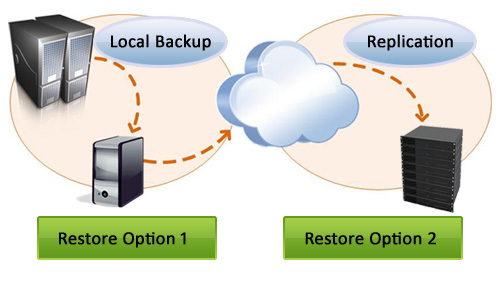 Reduces backup storage footprint by up to 12x over traditional backup solutions. Eliminates backup windows and eliminates full/incremental backup jobs. Control how long to keep snapshots for compliance and retention purposes. Snapshots can be generated every 15 minutes reducing data loss. Fast backups - only 1% overhead on production servers. Let us guide you through a LIVE DEMONSTRATION of our continuous network data backup. You are under no obligation to purchase, sign, or agree to anything. We are offering a free, no-strings-attached evaluation to help you protect your data. This is proven to be the best reliable online data backup and recovery solution you will need for your small business - online, automated, fast data recovery, no more tapes! Take the worry out of backup and recovery with our continuous data backup. 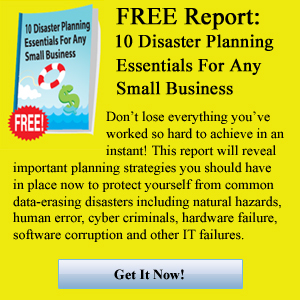 Contact us to day for your free backup analysis!